I saw a bright green book shelf on the side of the road. It was calling my name, so I had to pull over and put it in the back of my car. Yes, I was that girl hauling someone else's junk away. 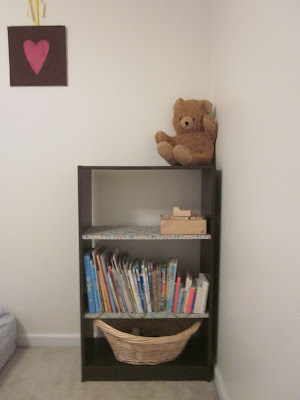 It was not the most quality bookshelf, but still very stable and in perfect condition. It sat in my garage for awhile, annoying me, until I figured out what to do with it. Most of the green paint peeled right off, except for on the shelves. 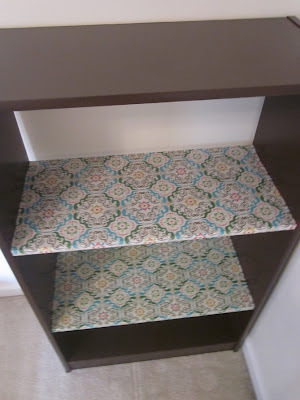 I had to figure out a way to hide those nasty shelves. So first I spray painted the whole thing brown with two cans of spray paint. 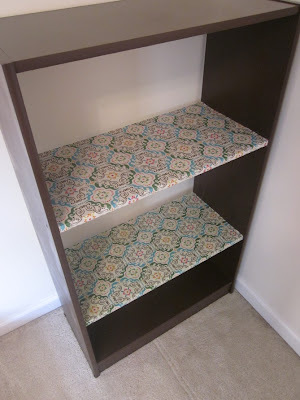 Then I covered the shelves with fabric I bought at Hobby Lobby, and Mod podged it on! It worked great! 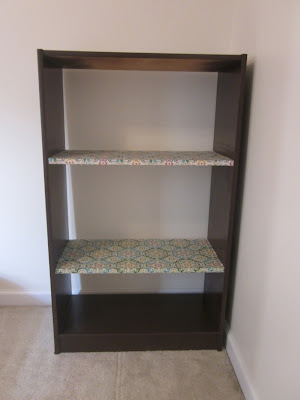 The best part is, the fabric is rough, not slick, so books do not fall over very easily. It looks nice and is functional. And inexpensive. All very important qualities to me.